Chef Yudy Nunez’s passion for food and perfection has brought her to Chef Angelo’s Private Dining Service. 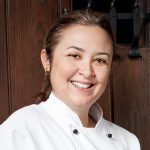 Born in Venezuela, Chef is an experienced executive chef for major hotel properties in Orlando, her range of culinary talent extends from Latin America to Europe to Asia and back again. Chef Yudy now freelances with Chef Angelo as well as hotel and restaurant properties in the area.